What should I do if I think I have Perinatal Mood Disorder (PPMD)? Call your medical provider. Below you can learn how to find someone with relevant experience. Call a therapist who specializes in treating pregnant or postpartum women. Contact the Postpartum Depression Alliance of IL at Email Support or 847 205-4455 (a helpline volunteer will email or call you back within 24 hrs) for support and information. Ask friends or family for help so you can take breaks. Tell someone how you feel and find someone you trust that can help you. If you feel that you need immediate care, call NorthShore University HealthSystem 1-866-364-MOMS hotline, your local hospital, 911 or 1-800- SUICIDE. If you are a woman experiencing any of the feelings mentioned on the Symptoms Page, or if you are observing these signs in a friend or family member, contact a health care provider. A complete medical evaluation, including thyroid screening, is necessary as under or overactive thyroid and other diseases can mimic depression or anxiety symptoms. Most women suffering from perinatal (another name for pregnancy & postpartum) mood disorders realize that something is wrong, but often do not seek help. The important thing to remember is that the symptoms are temporary and treatable with skilled professional care and social support. It is important to remember that you are not alone, it is not your fault and with help, you will recover! How should I choose a Mental Health Provider? You may want to ask a mental health provider the following questions. Good professionals will not mind taking time to talk to you about their experience and level of expertise. What specific training have you received in diagnosing and treating perinatal mood disorders? Professionals who have specialist skills workng with perinatal mood disorders will have attended many conferences and workshops and have likely presented at them and published research. Attending one or two short workshops or a webinar does not make someone an expert. How many years have you been treating women with pregnancy and postpartum mood disorders? How many women have you treated who are experiencing similar syptoms to me? Specialists will have treated over 50 women and have over 5 years of clinical experience. If you live in an area that doesn’t have providers with perinatal experience ask them whether they are willing to seek consultation from providers with more experience. Are you a licensed Psychologist, Clinical Social Worker or Clinical Professional Counselor? Make sure you see someone who is licensed. Do you belong to any organization that educates its members about PPD? The main organization in the US is Postpartum Support International. What type of psychotherapy are you trained in? Studies have shown that cognitive-behavioral therapy (CBT) and interpersonal therapy (IP) work best in treating PPD. CBT can help you identify and change inaccurate perceptions of yourself and the world around you, while IP focuses on how you behave and interact with family, friends, and other people in your life. Long-term psychoanalysis, which may continue over many months or even years, is usually not the best approach for PPD. What self-help will help me feel better? Perinatal mood disorders (PPMDs) can be successfully treated with medications, psychotherapy, or a combination of both. There are several types of psychotherapy that have been shown to be effective for depression including Cognitive-behavioral therapy (CBT) and interpersonal therapy (IPT ) have been shown as the most effective types of therapy for PPMD. Research has shown that mild to moderate depression can often be treated successfully with either approach alone. Severe depression may be best treated with a combination of psychotherapy and medication. Medication is especially appropriate in patients with more severe or chronic symptoms, prior episodes or family histories, or who have done well with medication in the past. Reach out to informed providers until you get the treatment that is right for you and you will begin to feel better. Can a workshop for new moms help? Our Emotional Wellness For New Moms workshop can be helpful because it is safe place to talk with others who understand what it is like to be a new mom and the stresses that it can bring. It is led by our Director who has over 20 years experience helping women transition to motherhood and she shares helpful information about how to care for yourself. She also encourages workshop members to share non-judgmental support and suggestions. You can share your experience or simply choose to listen. The Emotional Wellness For New Moms workshop is not a substitute for professional care but rather is a great way to reach out to others who understand and give support and advice. For more information about our workshop and how our volunteers can help support you through email and telephone support click here. 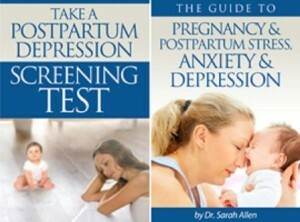 For more information about the different types of pregnancy and postpartum mood disorders and what can help you get better please download a free booklet Guide to Pregnancy & Postpartum Stress, Anxiety & Depression click here.